Ropa Vieja, which literally translates to “old clothes,” or as my paternal grandmother would call them, “schmatas,” is the Cuban answer to a traditional Jewish brisket. Both use inexpensive cuts of meat that are slow-roasted until tender and falling apart, but Ropa Vieja takes it a step further, and actually calls for the chunks of meat to be shredded to resemble rags. This may seem like it would diminish the allure of the dish, but as Jewish brisket is usually reserved for the holiday table, a good Ropa Vieja is truly cause for celebration. 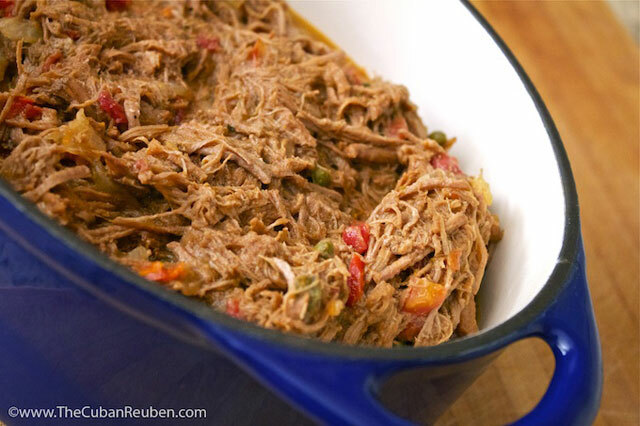 Additionally, as it is important in the Jewish culture to pass our traditions from generation to generation, most Cuban families have had a recipe for Ropa Vieja for ages.